Nome (/ˈnoʊm/; Inupiaq: Siqnazuaq IPA: [siqnɐzuɑq]) is a city in the Nome Census Area in the Unorganized Borough of Alaska, United States. 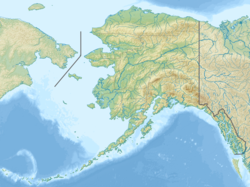 The city is located on the southern Seward Peninsula coast on Norton Sound of the Bering Sea. In 2016 the population was estimated at 3,797, a rise from the 3,598 recorded in the 2010 Census, up from 3,505 in 2000. Nome was incorporated on April 9, 1901, and was once the most-populous city in Alaska. Nome lies within the region of the Bering Straits Native Corporation, which is headquartered in Nome. In the winter of 1925, a diphtheria epidemic raged among Alaska Natives in the Nome area. Fierce territory-wide blizzard conditions prevented the delivery of a life-saving serum by airplane from Anchorage. A relay of dog sled teams was organized to deliver the serum. The origin of the city's name "Nome" is debated; there are three theories. The first is that the name was given by Nome's founder, Jafet Lindeberg, an immigrant from Norway. Nome appears as a toponym in several places in Norway. A second theory is that Nome received its name through an error: allegedly when a British cartographer copied an ambiguous annotation made by a British officer on a nautical chart, while on a voyage up the Bering Strait. The officer had written "? Name" next to the unnamed cape. The mapmaker misread the annotation as "C. Nome", or Cape Nome, and used that name on his own chart; the city in turn took its name from the cape. The third proposed origin of the name is from a misunderstanding of the local Inupiaq word for "Where at? ", Naami. 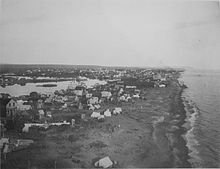 In February 1899, some local miners and merchants voted to change the name from Nome to Anvil City, because of the confusion with Cape Nome, 12 miles (19 km) south, and the Nome River, the mouth of which is 4 mi (6.4 km) south of Nome. The United States Post Office in Nome refused to accept the change. Fearing a move of the post office to Nome City, a mining camp on the Nome River, the merchants unhappily agreed to change the name of Anvil City back to Nome. Nome is located at 64°30′14″N 165°23′58″W﻿ / ﻿64.50389°N 165.39944°W﻿ / 64.50389; -165.39944 (64.503889, -165.399444). According to the United States Census Bureau, the city has a total area of 21.6 square miles (56 km2), of which 12.5 square miles (32 km2) is land and 9.1 square miles (23.6 km2) (41.99%) is water. Nome has a subarctic climate (Köppen Dfc), with long, very cold winters, and short, cool summers. However, conditions in both winter and summer are moderated by the city's coastal location: winters are less severe than in the Interior, and conversely, summers are lukewarm. For example, Fairbanks at a similar parallel quite far inland has much greater temperature swings with both very warm and cold temperatures throughout the year. The coldest month is January, averaging 5.2 °F (−14.9 °C), although highs on average breach the freezing point on 2–4 days per month from December to March and there are 76 days annually of 0 °F (−17.8 °C) or lower temperatures, which have been recorded as early as October 12, 1996 and as late as May 5 in 1984. Average highs stay below freezing from late October until late April, and the average first and last dates of freezing lows are August 30 and June 9, respectively, a freeze-free period of 81 days. The warmest month is July, with an average of 52.2 °F (11.2 °C); temperatures rarely reach 80 °F (27 °C) or remain above 60 °F (16 °C) the whole night. Snow averages 76 inches (190 cm) per season, with the average first and last dates of measurable (≥0.1 inches or 0.25 centimetres) snowfall being October 4 and May 16; accumulating snow has not been officially observed in July or August. Precipitation is greatest in the summer months, and averages 16.8 inches (426.7 mm) per year. The annual average temperature is 27.35 °F (−2.58 °C). Extreme temperatures range from −54 °F (−47.8 °C) on January 27–28, 1989 up to 86 °F (30 °C) on June 19, 2013 and July 31, 1977. The hottest month has been July 1977 with a mean temperature of 56.3 °F or 13.5 °C and the coldest February 1990 with a mean of −17.2 °F or −27.3 °C. Nome first appeared on the 1900 U.S. Census as an unincorporated village of 12,488 residents. At the time, it was the largest community in Alaska, ahead of Skagway and Juneau, the 2nd and 3rd largest places. The demographics for 1900 included 12,395 Whites, 42 Natives, 41 Asians and 10 Blacks. It was formally incorporated as a city in 1901. By 1910, it had fallen to 2,600 residents. Of those, 2,311 were White, 235 were Natives and 54 for all other races. It dropped to the 2nd largest city in Alaska behind Fairbanks. By 1920, it dropped to 9th place, with just 852 residents. In 1930, it rose to 6th largest with 1,213 residents (882 Whites, 326 Natives, 5 others). In 1940, it remained in 6th place with 1,559 residents. It dropped to 10th place in 1950 with 1,876 residents. In 1960, it rose to 8th place with 2,316 residents (with 1,608 "other", which was mostly Native; 705 Whites and 3 Blacks). 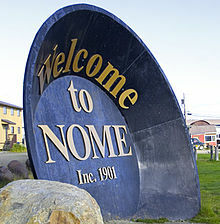 By 1970, Nome had fallen out of the top 10 places to 18th largest community (although 9th largest incorporated city). In 1980, it was 15th largest (12th largest incorporated city). In 1990, it was 16th largest (12th largest incorporated city). In 2000, it was 25th largest (16th largest incorporated city). In 2010, it was now the 30th largest (16th largest incorporated city). As of the census of 2000, there were 3,505 people, 1,184 households, and 749 families residing in the city. The population density was 279.7 people per square mile (108.0/km²). There were 1,356 housing units at an average density of 108.2 per square mile (41.8/km²). The racial makeup of the city was 51.04% Native American, 37.89% White, 1.54% Asian, 0.86% Black or African American, 0.06% Pacific Islander, 0.43% from other races, and 8.19% from two or more races, Hispanic or Latino of any race were 2.05% of the population. There were 1,184 households out of which 38.9% had children under the age of 18 living with them, 41.7% were married couples living together, 12.3% had a female householder with no husband present, and 36.7% were non-families. 27.4% of all households were made up of individuals and 3.7% had someone living alone who was 65 years of age or older. The average household size was 2.79 and the average family size was 3.45. In the city, the age distribution of the population shows 31.9% under the age of 18, 8.0% from 18 to 24, 32.1% from 25 to 44, 21.7% from 45 to 64, and 6.2% who were 65 years of age or older. The median age was 32 years. For every 100 females, there were 115.2 males. For every 100 females age 18 and over, there were 117.8 males. The median income for a household in the city was $59,402, and the median income for a family was $68,804. Males had a median income of $50,521 versus $35,804 for females. The per capita income for the city is $23,402. About 5.4% of families and 6.3% of the population were below the poverty line, including 4.3% under the age of 18 and 6.9% ages 65 or older. The population of Nome is a mixture of Inupiat Eskimos and non-Natives. Although some employment opportunities are available, subsistence activities are prevalent in the community. A federally recognized tribe is located in the community, the Nome Eskimo Community. 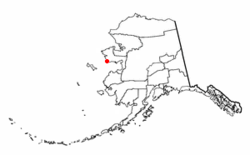 Former villagers from King Island also live in Nome. The ANCSA village corporation in Nome is Sitnasuak Native Corporation. Seven years later (1907), houses have replaced the tents. Inupiat hunted for game on the west coast of Alaska from prehistoric times and there is recent archeological evidence to suggest that there was an Inupiat settlement at Nome, known in Inupiat as Sitnasuak, before the discovery of gold. In the summer of 1898, the "Three Lucky Swedes": Norwegian-American Jafet Lindeberg, and two naturalized American citizens of Swedish birth, Erik Lindblom and John Brynteson, discovered gold on Anvil Creek. News of the discovery reached the outside world that winter. By 1899, Nome had a population of 10,000 and the area was organized as the Nome mining district. In that year, gold was found in the beach sands for dozens of miles along the coast at Nome, which spurred the stampede to new heights. Thousands more people poured into Nome during the spring of 1900 aboard steamships from the ports of Seattle and San Francisco. By 1900, a tent city on the beaches and on the treeless coast reached 48 km (30 mi), from Cape Rodney to Cape Nome. In June of that year, Nome averaged 1000 newcomers a day. In 1899, Charles D. Lane founded Wild Goose Mining & Trading Co. Lane through his company constructed the Wild Goose Railroad, which ran from Nome to Dexter Discovery. The Railroad would later be extend in 1906-1908 to the village of Shelton also known as Lanes Landing. Many late-comers tried to "jump" the original claims by filing mining claims covering the same ground. The federal judge for the area ruled the original claims valid, but some of the claim jumpers agreed to share their invalid claims with influential Washington politicians. Alexander McKenzie took an interest in the gold rush and secured the appointment of Arthur Noyes as the federal district judge for the Nome region for the purpose of taking control of gold placer mines in Nome. McKenzie seized mining claims with an unlawfully procured receivership granted by Judge Noyes. McKenzie's claim-jumping scheme was eventually stopped by the federal Ninth Circuit Court of Appeals. However, the episode provided the plot for Rex Beach's best-selling novel The Spoilers (1906), which was made into a stage play, then five times into movies, including two versions starring John Wayne: The Spoilers (1942 film) (co-starring Marlene Dietrich) and North to Alaska (1960, the theme of which mentions Nome.) Wyatt Earp, of Tombstone, Arizona fame, stayed in Nome for a while. In September 1899, Earp and partner Charles E. Hoxie built the Dexter Saloon, the city's first two-story wooden building and its largest and most luxurious saloon out of more than 60 saloons. During the period from 1900−1909, estimates of Nome's population reached as high as 20,000. The highest recorded population of Nome, in the 1900 United States census, was 12,488. At this time, Nome was the largest city in the Alaska Territory. Early in this period, the U.S. Army policed the area, and expelled any inhabitant each autumn who did not have shelter (or the resources to pay for shelter) for the harsh winter. By 1910 Nome's population had fallen to 2,600, and by 1934, to less than 1500. In May 1910, the Industrial Worker, the newspaper of the Industrial Workers of the World (IWW), published a notice from the Nome Miners' Union and Local 240 of the Western Federation of Miners for all unemployed workers to stay away, saying that "[a]ll the rich mines are practically worked out." Fires in 1905 and 1934, as well as violent storms in 1900, 1913, 1945 and 1974, destroyed much of Nome's gold rush era architecture. The pre-fire "Discovery Saloon" is now a private residence and is being slowly restored as a landmark. The Black Wolf Squadron, under the command of Capt. St. Clair Streett, landed here on 23 Aug. 1920, after the culmination of a 4527-mile flight from Mitchel Field.Noel Wien and Gene Miller based their air services from Nome in June 1927. The annual Iditarod Trail Sled Dog Race, which finishes in Nome, commemorates the 1925 serum run. In 1925, Nome was the destination of the famous Great Race of Mercy, in which dog sleds played a large part in transporting diphtheria serum through harsh conditions. In 1973, Nome became the ending point of the 1,049+ mi (1,600+ km) Iditarod Trail Sled Dog Race. The latter part of its route was used in the serum run. The sled driver of the final leg of the relay was the Norwegian-born Gunnar Kaasen; his lead sled dog was Balto. A statue of Balto by F.G. Roth stands near the zoo in Central Park, New York City. Leonhard Seppala ran the penultimate, and longest, leg of the 1925 serum run to Nome. One of his dogs, Togo, is considered the forgotten hero of the Great Race of Mercy; another of his dogs, Fritz, is preserved and on display at the Carrie M. McLain Memorial Museum in Nome. During World War II, Nome was the last stop on the ferry system for planes flying from the United States to the Soviet Union for the Lend-lease program. The airstrip currently in use was built and troops were stationed there. One "Birchwood" hangar remains and has been transferred to a local group with hopes to restore it. It is not located on the former Marks Air Force Base (now the primary Nome Airport); rather it is a remnant of an auxiliary landing field a mile or so away: "Satellite Field". In the hills north of the city, there were auxiliary facilities associated with the Distant Early Warning system that are visible from the city but are no longer in use. Total gold production for the Nome district has been at least 3.6 million troy ounces (110,000 kg). Nome's population decline continued after 1910 although at a fairly slow rate. By 1950 Nome had 1,852 inhabitants. By 1960 the population of Nome had climbed to 2,316. At this point placer gold mining was still the leading economic activity. The local Alaska Native population was involved in ivory carving and the U.S. military had stationed troops in the city also contributing to the local economy. The Hope Sled Dog Race was run between Anadyr, Russia, and Nome after the fall of the Soviet Union. The race continued for more than a decade, but has not been run since approximately 2004. Gold mining has been a major source of employment and revenue for Nome through to the present day. Mining's contribution to the town was estimated at $6 million dollars a year in 1990, before a major increase in the price of gold brought renewed interest to offshore leases (where 1,000,000 ounces of gold were estimated to be in reserve) and a subsequent boom in revenues and employment. 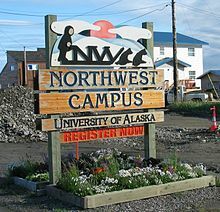 The University of Alaska Fairbanks operates a regional satellite facility in Nome called the Northwest Campus (formerly known as Northwest Community College). Anvil City Science Academy, a 5-8 charter magnet, is also part of the school district. Nome-Beltz Junior/Senior High School, serves grades 7-12. Nome Elementary School, serves grades K-6. Nome Adventist School, a private school encompassing grades 1 through 9. Nome's airwaves are filled by the radio stations KNOM (780 AM, 96.1 FM) and KICY (850 AM, 100.3 FM), plus a repeater of Fairbanks' KUAC, K217CK, on 91.3 FM. Cable television and broadband in Nome is serviced by GCI, which offers all popular cable channels, plus most of Anchorage's television stations. Nome also has three local low-powered stations, K09OW channel 9 and K13UG channel 13 (both carrying programming from ARCS), plus K11TH channel 11 (a 3ABN owned and operated translator). Nome also is home to Alaska's oldest newspaper, the Nome Nugget. Nome Airport – public-use airport located two nautical miles (3.7 km) west of the central business district of Nome, it has one asphalt paved runway: 3/21 measures 5,576 by 150 feet (1,700 x 46 m) and 10/28 is 6,001 by 150 feet (1,829 x 46 m). An $8.5 million airport improvement project is nearing completion. Nome City Field – a public-use airport located one nautical mile (1.85 km) north of the central business district of Nome, it has one runway designated 3/21 with a gravel surface measuring 1,950. It is serviced by general aviation. Nome has a seaport, used by freight ships and cruise ships, located at 64° 30’ N and 165° 24’ W on the southern side of the Seward Peninsula in Norton Sound. The Corps of Engineers completed the Nome Harbor Improvements Project in the summer of 2006 adding a 3,025 ft (922 m) breakwater east of the existing Causeway and a 270 ft (82 m) spur on the end of the Causeway making it to a total of 2,982 feet (909 m). The City Dock (south) on the Causeway is equipped with marine headers to handle the community's bulk cargo and fuel deliveries. The City Dock is approximately 200 feet (61 m) in length with a depth of 22.5 feet (MLLW). The WestGold Dock (north) is 190 feet (58 m) in length with the same depth of 22.5 feet (ML,LW). The Westgold dock handles nearly all of the exported rock/gravel for this region and is the primary location to load/unload heavy equipment. The opening between the new breakwater and the Causeway (Outer Harbor Entrance) is approximately 500 feet (150 m) in width and serves as access to both Causeway deep water docks and the new Snake River entrance that leads into the Small Boat Harbor. The old entrance along the seawall has been filled in and is no longer navigable. (See photos on website) Buoys outline the navigation channel from the outer harbor entrance into the inner harbor. The Nome Small Boat Harbor has a depth of 10 feet (MLLW) and offers protected mooring for recreational and fishing vessels alongside 2 floating docks. Smaller cargo vessels and landing craft load village freight and fuel at the east, west and south inner harbor sheet pile docks, east beach landing and west barge ramp for delivery in the region. A new addition to the Nome facility in 2005 was a 60-foot-wide (18 m) concrete barge ramp located inside the inner harbor just west of the Snake River entrance. The ramp provides the bulk cargo carriers with a suitable location closer to the Causeway to trans-load freight to landing craft and roll equipment on and off barges. This location also has approximately 2 acres (8,100 m2) of uplands to be used for container, vessel and equipment storage. The road system leading from Nome is extensive, though sparsely used during the winter months and leads mostly through remote terrain. Local roads lead to Council, the Kougarok River, and Teller: the Nome-Council, Nome-Taylor, and Nome-Teller Highways, respectively. 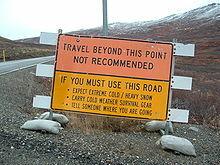 There are also smaller roads to communities up to 87 miles (140 km) from Nome, yet no road connection to the other major cities of Alaska. There are no railroads going to or from Nome. A 500-mile (800 km) road project (Manley Hot Springs–Nome) is being discussed in Alaska. It has been estimated (as of 2010) to cost $2.3 to $2.7 billion, or approximately $5 million per mile. Local hospitals and medical centers include Norton Sound Regional Hospital and Nome Health Center. The hospital is a qualified acute care facility and medevac service. Long term care is provided by Quyaana Care Center (a unit of the hospital). Specialized care is available through various facilities such as Norton Sound Community Mental Health Center, Turning Point – Saquigvik (transitional living), and XYZ Senior Center. 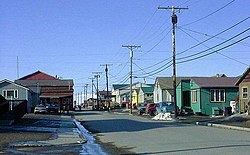 Nome is classified as a large town/Regional Center, it is found in EMS Region 5A in the Norton Sound Region. Emergency Services have limited highway, coastal and airport access. Emergency service is provided by 911 Telephone Service and by Nome Volunteer Ambulance Dept. The reality television series Bering Sea Gold is set and filmed in Nome. At least two major films have been set in Nome, but not filmed there: the 1995 animated/live-action family film Balto starring Kevin Bacon, and the 2009 science-fiction/horror film The Fourth Kind starring Milla Jovovich. In "Ice", a 1993 episode of the television series X-Files, Mulder and Scully are sent to a remote Alaskan research facility at Icy Cape in which a five-member team are found dead, possibly due to an alien lifeform that infects a human host and makes its host want to kill other people. Towards the end of the episode, the personnel from Doolittle Airfield (a fictional military installation named after real-life General James (Jimmy) H. Doolittle, a former resident and WWI fighter pilot and Medal of Honor recipient) in Nome, Alaska, rescue the remaining survivors and the last infected victim (character Nancy Da Silva played by Felicity Huffman) is airlifted out of the base. The 2002 Disney comedy/adventure film Snow Dogs, starring Cuba Gooding Jr. and James Coburn, is set against the running of the Iditarod race. An episode of the Lucy-Desi Comedy Hour depicts the Ricardo and Mertz families buying land in Nome. In episode 1 of the 1997 BBC television travel series Full Circle, British actor, comedian, writer and presenter Michael Palin (of Monty Python fame), traveled to Nome and met a goldpanner on the "Golden Sands of Nome". In The Simpsons Movie, the Simpsons seek refuge in Alaska. In their new log cabin home, Marge Simpson is seen knitting a tapestry that says "Nome Sweet Nome", which implies the family may have taken up residence in Nome. In the 2018 alternate history short story Liberating Alaska by Harry Turtledove, Nome (under the name Siknazuak, which is a variant of its Iñupiat name) in the story is taken over by the Soviet Union in June 1929 and is eventually liberated by the United States Marine Corps. In the story, Alaska isn't sold to the US in 1867 and remains part of Russia until the end of the Russian Civil War when Vladimir Lenin is forced to cede Alaska to the US following the Allied intervention in the war. True-life 1970s adventures while serving as the sole physician in Nome are recounted in "On Call in the Arctic" by Thomas J. Sims, M.D. (Pegasus 2018). ^ 1996 Alaska Municipal Officials Directory. Juneau: Alaska Municipal League/Alaska Department of Community and Regional Affairs. January 1996. p. 106. ^ "Mayor". City of Nome, Alaska. ^ "Nome Convention and Visitor Bureau". Archived from the original on 2008-03-15. Retrieved 2008-01-17. ^ "Iñupiat Eskimo dictionary" (PDF). Alaska Government. Alaska Rural School Project Department of Education. p. 166. Retrieved 22 February 2017. ^ "NOWData - NOAA Online Weather Data". National Oceanic and Atmospheric Administration. Retrieved 23 September 2015. ^ "AK NOME MUNI AP". National Oceanic and Atmospheric Administration. Retrieved 23 September 2015. ^ "WMO Climate Normals for Nome, AK 1961–1990". National Oceanic and Atmospheric Administration. Retrieved 23 September 2015. ^ sherri, McBride (1996). "Trains of the Seward Peninsula" (PDF). ^ "The Spoilers". Miningswindles.com. Retrieved 2013-01-23. ^ Please notice, according to North to Alaska-article the film is based on the play Birthday Gift by Ladislas Fodor. ^ "Workers Stay Away from the Frozen North". Industrial Worker. 2 (9). 21 May 1910. p. 1. ^ Harkey, Ira (1991). Pioneer Bush Pilot. Bantam Books. p. 183-184. ISBN 0553289195. ^ Rearden, Jim (2009). Alaska's First Bush Pilots, 1923-30. Missoula: Pictorial Histories Publishing Company, Inc. p. 39-40. ISBN 9781575101477. ^ "Togo Sled Dog Overlooked by History". Turtlezen.com. 1929-12-05. Retrieved 2013-01-23. ^ A.H Koschman and M.H. Bergendahl (1968) Principal Gold-Producing Districts of the United States, U.S. Geological Survey, Professional Paper 610, p.18. ^ "Nome Offshore Placer deposits (ARDF #NM253) Au". mrdata.usgs.gov. Retrieved 2019-01-27. ^ Stinson, Holly (1991). "Nome: Gold & Government Rule the Economy" (PDF). Alaska Department of Labor. ^ "General Information". Nome Convention and Visitors Bureau. Archived from the original on 2009-08-16. Retrieved 2008-09-16. ^ Cockerham, Sean (January 27, 2010). "Nome road could cost $2.7 billion". Anchorage Daily News. Archived from the original on 30 January 2010. Retrieved 7 February 2010. ^ "Jimmy Doolittle". U-S-History.com. Retrieved December 22, 2017. Wikimedia Commons has media related to Nome. Wikivoyage has a travel guide for Nome, Alaska. Wikisource has the text of the 1911 Encyclopædia Britannica article Nome. "Nome" . Collier's New Encyclopedia. 1921.